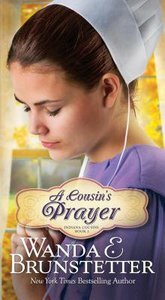 Katie Miller, a young Amish girl traumatized by the death of her boyfriend, returns home, fettered by the bonds of fear. What will give her the courage to face life again? Freeman Bontrager yearns to make Katie his own. Can he help Katie overcome her emotional problems and win her "whole" heart? About "A Cousin's Prayer (#02 in Indiana Cousins Series)"
Unavailable. We are unsure when this item will be available to ship. Other edition is available. 9781683220688 0 Available. Order now to secure your copy when our stock arrives. Other edition is available. 9781683220695 0 Available. Expected to ship in 5 to 6 weeks from Australia.